Jeremy Zuttah re-joined the Ravens. The guard and the team agreed to a two-year deal. Baltimore was desperate for offensive line help, so it makes sense that they would target a familiar face. In their first preseason game, the offensive line surrendered three sacks and 10 total pressures, ranking 23rd in pass blocking efficiency (71.6). In their second game, the offensive line did not allow a sack, but it was clear there were issues with consistency, as the line was called for multiple holding penalties and false starts. Zuttah will be expected to bring some consistency back to the line. The Ravens have been swapping numerous players along the line, including trying out G Ryan Jensen at center. 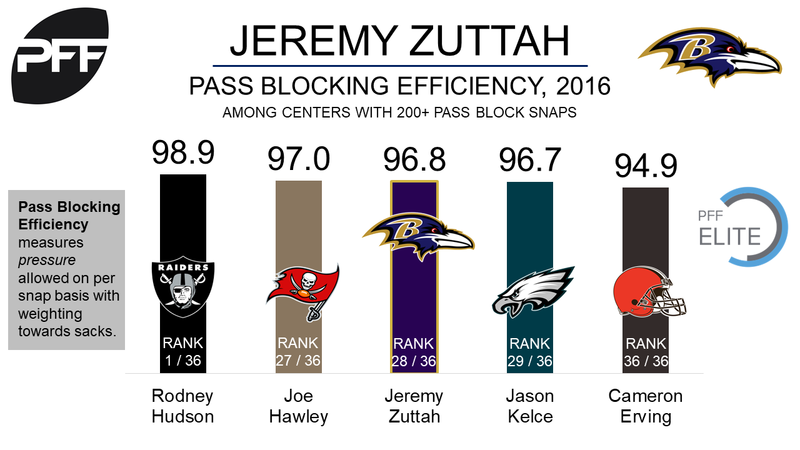 In 2016, Zuttah had the most pass block snaps of any center in the league (713), and he allowed three sacks, one quarterback hit, and 25 quarterback hurries on those snaps. The Eagles rookie Derek Barnett has been dominant in the preseason. Through two games so far, he’s been excellent at rushing the passer. Barnett has rushed the passer 42 times in his 59 snaps across two preseason games, getting home three times for sacks, but also racking up an additional two hits and four hurries. He owns the league’s second-best pass rushing productivity score so far this preseason among 4-3 defensive ends. The Eagles own the top three scores as a team. Barnett broke the sack record at the University of Tennessee, a record that had belonged to a certain Reggie White, and over the past three seasons of college play racked up 188 total pressures playing in the SEC. He is going to get first team reps for the Eagles based on his preseason performances thus far. There’s a quarterback battle in Jacksonville. After Thursday’s preseason game, head coach Doug Marrone said the starting position was up for grabs. Bortles struggled in 2016, posting a PFF overall grade of 69.2, which was down on his 2015 total of 80.8. One of the things that deserted Bortles in 2016 was his deep passing ability, with only 410 passing yards coming from deep passes (passes 20 or more yards downfield), whereas in 2015 his 1,330 yards ranked first in the league. Bortles has also struggled with deep passes thus far in the preseason, completing none of his 3 deep passing attempts, while Henne and Brandon Allen, the other quarterback on the Jaguars roster, both have touchdowns on deep passes. 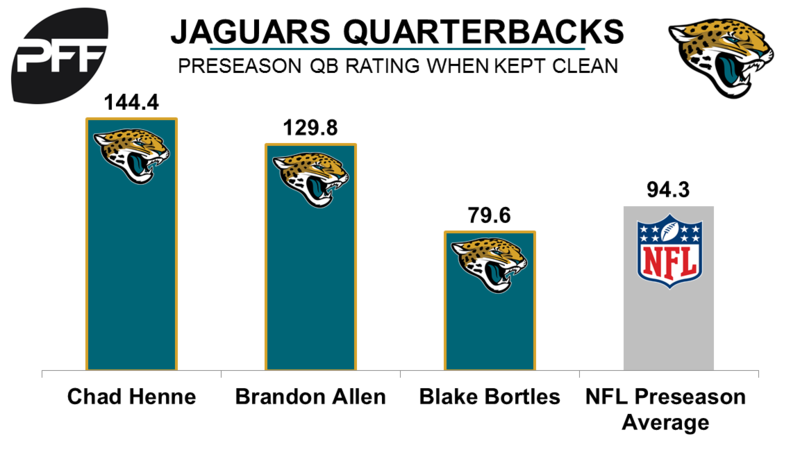 Both Allen and Henne have also performed better under pressure than Bortles, with Allen leading the trio with a passer rating of 135.4, Henne 64.6 and Bortles 42.4. Bortles’ passer rating of 79.6 is also the lowest of the three when not under pressure. Henne tops this category with a QB rating of 144.4 when not under pressure. Jay Cutler made his preseason debut with the Dolphins. He only played two series. His debut only lasted two series as three of Cutler’s six attempts targeted DaVante Parker, not including a 31-yard completion to Parker that was called back due to a penalty. But Cutler is coming off the lowest graded season of his career, in 2016 while only playing five games he posted a 47.1 grade. Cutler had a career year when throwing 20 or more yards downfield while Gase was calling the plays, his 96.3 passer rating when passing deep was the highest of his career. There’s no end in sight for the Aaron Donald hold out. Donald could possibly hold out into the regular season. 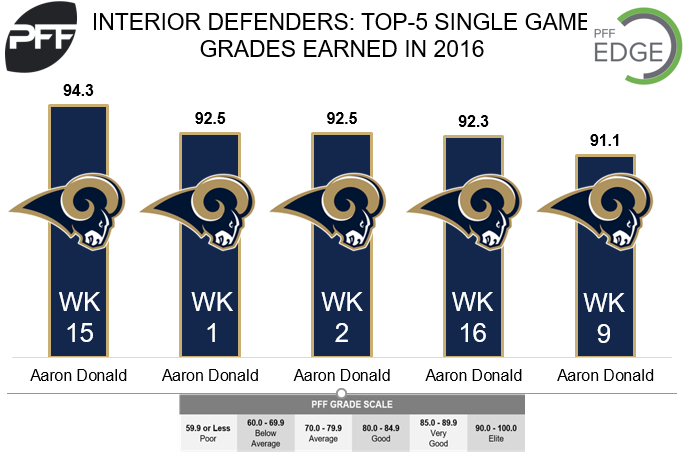 Not only did Donald have the five highest single game grades in 2016, he was also the highest graded interior defender for 10 of the 16 weeks last season. With 30 defensive stops (fifth) on 276 run snaps, Donald was able to produce a run stop on 10.9 percent of his run plays (fifth).